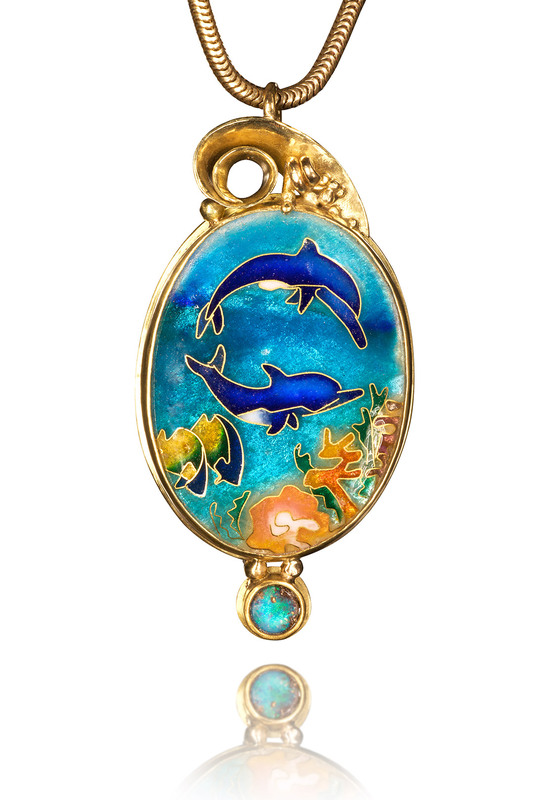 Dolphins in the Sea is a cloisonne jewelry piece created by Patsy Croft. It belongs to Ocean collection of amazing enamel jewelry with unique jewelry designs. Determined to bring awareness to the importance of our waters, not just for us, but for the dolphins, I have created this unique jewelry design, my own drawing, making this one of a kind gold jewelry pendant. With cloisonné enamel jewelry, applying the 24k gold wire for the lines of my drawing, on to the fine silver, was the initial step. Painstakingly adding the fine grains of enamel, no more than three at a time, was the process I liken to painting on a canvas. I add depth and contrast, bring it alive and make it vibrant with these enamel colors. The beautiful greens of the ocean are what I see on my dives many oceans. The varying hues of blue are just how the sun plays on the surface of the dolphin as they swim past me when I dive. Living in Hawaii they swam past me like trains going by. They are a precious and integral part of our beautiful world. I feel it’s of the utmost importance for us to take care of our waters, for our generation and for the future of our children. Wearing this gold enamel jewelry helps to bring the awareness to you and to all who see you wearing it. This cloisonné enamel jewel is set in 18k gold, and measures 1.5 ” x 1”. Dolphins range in size from the 1.7 m (5.6 ft) long and 50 kg (110 lb) Maui’s dolphin to the 9.5 m (31 ft) and 10 t (11 short tons) killer whale. Several species exhibit sexual dimorphism, in that the males are larger than females. They have streamlined bodies and two limbs that are modified into flippers. Though not quite as flexible as seals, some dolphins can travel at 55.5 km/h (34.5 mph). Dolphins use their conical shaped teeth to capture fast moving prey. They have well-developed hearing which is adapted for both air and water and is so well developed that some can survive even if they are blind. Some species are well adapted for diving to great depths. They have a layer of fat, or blubber, under the skin to keep warm in the cold water.